We supply the world leading Sentek EnviroSCAN™ soil moisture monitoring probe with automated GPRS remote data collection. In addition we provide a complete installation, data management, web based data hosting and interpretation service to our clients. This data is collected remotely via GPRS and securely displayed on the internet. Our client irrigation managers are able to access their information from any internet enable device, be it computer or smart phone. 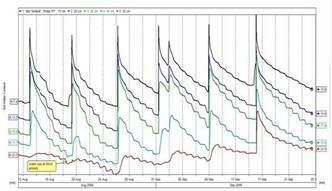 We use the powerful Irrimax8 graphical software to display EnviroSCAN™ soil moisture data in a clear and intuitive format. 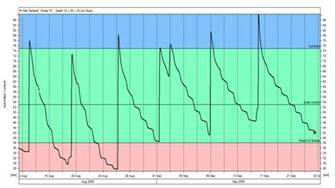 A graph of the separate sensors allows us to see exactly at what depth and what rate the crop is drawing water. A summed graph gives you a very visual picture of how much water remains available to the crop. The primary aim is to keep in the green zone where water is freely available to the crop. See our crop knowledge pages for lots more examples of EnviroSCAN™ data.